"Possessed" The definitive book dedicated to the exciting world of Giant Bluefin Tuna fishing. Hello friends of Mass Bay Guides. My name is Ken Fraser, world record holder for the giant bluefin tuna, The world record bluefin tuna is 1496 lbs. It was caught off Nova Scotia, Canada, 30 years ago, on October 26th, 1979. Find out what it takes to capture a world record tuna and get it into the I.G.F.A. record books in Ken's book POSSESSED. 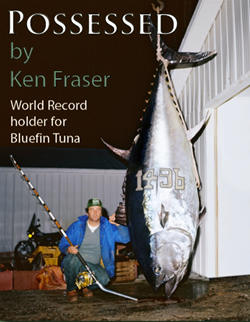 The book is in English, 243 pages in full color, the full story Ken Fraser's journey and frustrations searching for a world record Giant Bluefin Tuna. The journey itself took many years to complete and the book came along 25 years later. POSSESSED The story of the world record Bluefin Tuna has been sold in over 30 Countries and counting. You can enjoy this remarkable achievement by ordering your signed copy of POSSESSED by ordering direct from the author. The cost of the book is $34.99, plus 5% tax, (Canadian exchange rate) plus postage, If you would like a signed copy of the book To order, I will need your complete mailing address and phone number, book or books will be put in the mail with an invoice inside the front cover. You can send me a money order or cheque by return mail after you have received your book or books. Please let me know how you would like it signed.